Slip Ring Motors are primarily used to start high inertia load or a load that requires a starting torque across a full speed range. By correctly selecting the resistors inserted into the Rotor circuit, the motor is able to produce maximum torque at a relatively low current from zero to full speed. The magnitude of starting torque can be controlled by resistance values; the number of starting steps vary depending upon peak torque limitations required by application. For example, a conveyor drive would have more starting steps than a ball mill. 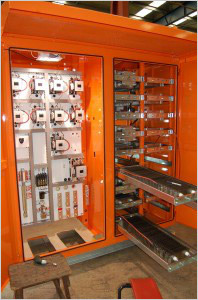 Single starting times can be set by timers, PLC control or tacho feed back. 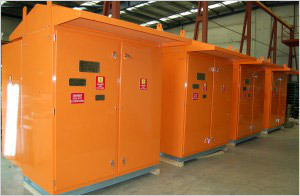 For High Voltage wound motors, on the stator side, a High Voltage Circuit Breaker or Vacuum Contactor can be incorporated into the design. 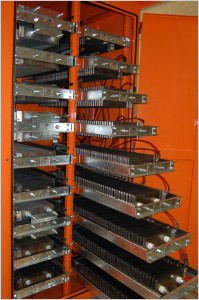 Low voltage motors use standard Contactors and motor protection units. Rotor Contactors are selected for staged starting duty with the final slip ring shorting Contactor being fully rated to the motor full load current. 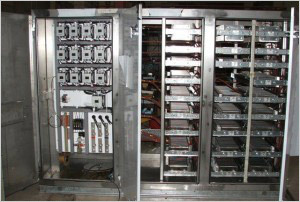 Starter housing are designed for either indoor or outdoor locations – sized to meet the environment, number of Contactors and Resistors for the application. Resistors need to be designed to allow for the starting duty cycle without overheating or too high a change in resistance value when hot, as this influences the starting characteristics. Rotor Resistance Starters are very reliable, need little maintenance, not unduly influenced by extreme environmental conditions and for outdoor application can be cyclone rated.